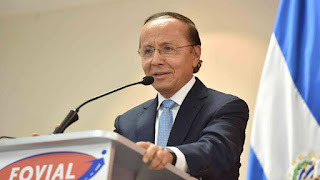 The leadership of the left wing FMLN has apparently chosen the former Minister of Public Works, Gerson Martínez, to be the party's candidate for the 2019 presidential elections in El Salvador. The FMLN has held the presidency since 2009, but faces an uphill challenge in 2019 with an unpopular current president and the presidential ambitions of San Salvador mayor Nayib Bukele and his new political party called Nuevas Ideas (New Ideas). Gerson Martínez is a 63 year old former guerrilla. His actual name is Manuel Orlando Quinteros Aguilar, but he has used the name Gerson Martínez since the time he was a student activist. He was one of the persons involved in the founding of the FMLN guerrilla coalition in 1980 and played leadership roles in the FMLN guerrilla movement during the country's civil war. After the signing of the 1992 Peace Accords, Martínez was elected to the National Assembly as an FMLN deputy in 1994 and was re-elected every three years until 2009 when he was appointed Minister of Public Works by president Mauricio Funes. He continued to serve in that role in the Sánchez Cerén administration up until November 2017, when he left office to pursue the presidency of El Salvador. The FMLN's decision was a blow to the presidential aspirations of current vice president Oscar Ortiz. Ortiz had signaled his intentions to seek the presidency in 2019, and has long been discussed a candidate. The decision also puts to rest reports from a year ago that the party would nominate Medardo Gonzalez, the FMLN general secretary, as its candidate. Regardless of whether the FMLN picked Gerson Martínez or Oscar Ortiz, it is not clear the party can win in 2019. In opinion polls, both men trail significantly in a three way race against independent candidate Nayib Bukele and either of the two primary ARENA possible candidates. Bukele leads the ARENA candidates by almost 2-1 and leads both Ortiz and Martinez by almost 4-1.